Slider 1 Rhythm Swing % Controls the percentage of swing (or hip-hop feeling). 0% = no swing, 50% = triplets, and 100% pushes the swung notes all the way to the next value of half the note length set by the “Swing Note Value” parameter. A value of 101 selects +200%, and a value of 102 selects –200%. Slider 2 Rhythm Complexity -OR- Pattern Controls the rhythm pattern of generated notes. Since there are several different ways of controlling rhythm in GEs, including varying the Random Ties Factor on a Rhythm Pattern containing random ties, or switching the entire Rhythm Pattern using one of multiple Rhythm Pattern Templates, the exact function may be different depending on the GE. 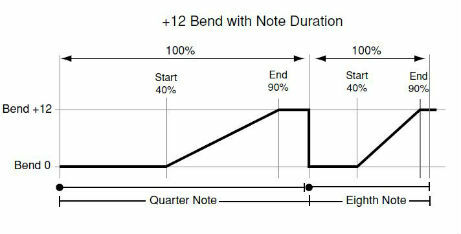 Slider 3 Duration Control Controls the length of time (sustain) of generated notes. The values available (i.e. percentage-based or time-based) are dependent upon the Duration Mode parameter's setting, which is not typically accessible in the keyboard itself. See the Duration Control Reference article for more detail. Slider 4 Velocity Accents -OR- Pattern Controls the the percentage scale of the velocity values of generated notes based on a selected Velocity Pattern, which subtracts from the initial velocities input or played to provide accents on some notes. This slider is set to reverse (-) polarity so that moving the slider all the way up will produce a KARMA value of 0 (zero percent - or no change to velocities), and moving the slider downward will increase the percentage value and scale the Velocity Pattern accordingly. Slider 5 Note Range Controls how many times the generated notes will be replicated up or down the keyboard according to the Note Series: Interval RTP (Switch 3), which is typically set to +/- 12 semitones (one octave). This slider is assigned to the Note Series: Replications RTP. Values are expressed as x100, therefore a value of 100 equals one octave, 200 = two octaves, 300 = three octaves, and 400 = four octaves when the Interval parameter is set to +/- 12. Slider 6 Bend Start % Specifies when the pitch bend will start in the overall bend window, based on the Bend: Length parameter or note duration. A setting of 0% means the pitch bend will start immediately. Increasing this value will delay the start of the pitch bend accordingly, e.g. 50% means that the note will initially play and hold its starting pitch for half of its duration before the pitch bend occurs. This GE RTP is also covered in the Karma-Lab video tutorial series: House 101: Combi Creation Series, in Chapter 29: Pitch Bending - Part 1. Slider 7 Repeat Repetitions Sets the number of repeated notes to generate using the Repeat: Repetitions parameter. This RTC is most often configured between 0 and 8 repetitions (although this does vary depending on the GE). A value of 0 means no repeated notes will be generated; a value of 101 will cause notes to be repeated indefinitely until something stops them. Note that some repetitions may not be generated depending on other RTPs, such as the Repeat: Range group of parameters. Slider 8 Repeat Transpose Sets the amount by which each successive repeated note is transposed in semitone values, producing melodic repeats. This is most often configured within the full range of +/-24 semitones. A special KARMA value of 25 uses the GE's Index Pattern as a transposition table to transpose the repeated notes, so that each repeated note is transposed by a different amount from the previous repeated note. Switch 1 Force Mono Sets whether the GE will play monophonically (ON) or polyphonically (OFF). When switched ON, clusters will be suppressed and only one note (the lowest note) will be played, and note durations will not overlap the next triggered note in the series. Useful for thinning out dense GEs for polyphonic programs, or correcting the behaviour of monophonic programs. Switch 2 Note Scale Type Controls how the Note Series is generated, and by default switches between Regular mode (actual notes played) and Scalic 1 mode (chord analysis). For more on this parameter see Note Series: Note Type Tutorial. Switch 3 Invert Phrase This is basically a note (or chord) pattern UP/DOWN switch. It is connected to three Note Series GE RTP (see below): Note Series: Input Sort, Note Series: Inversion and Note Series: Interval. If a note pattern was playing C, D, E, G, this switch will invert or reverse the pattern to G, E, D, C.
Switch 4 Note Pattrn<>Random Controls whether the Index Pattern will be played according to the steps in the pattern grid (viewable in the KARMA Software) when switched OFF or randomised when switched ON. This affects which notes in the Note Series are played at each rhythm step. Switch 5 Bend On/Off Turns ON or OFF pitch-bending effects, which are further programmed or controlled by these GE RTP (see below): Bend: Start % (on Slider 6), Bend: Length, and Bend: Amount (on Switch 6). Switch 6 Bend Direction Controls the direction of the pitch-bend effect (bend up or bend down) as programmed by the Bend: Amount GE RTP. In respect of this RTC Model, it is most commonly programmed to bend down or up -12 / +12 semitones, however some GEs (Arp models, for example) are set to a value of 13 or "Next Note" for pitches bending up (i.e. Bends each note to what will be the next note, creating a portamento-like effect). Note: the actual resulting size of the bend also depends on the setting of the Bend Range parameter, which sets the overall pitch-bend range for the GE. Furthermore, adjustments may be required to the timbre's pitch-bend settings in order for the bending effects to work properly.